While the EU remains on track to meet its 2020 emissions reduction target, updated data shows Member States cannot afford to take progress beyond that date for granted. The data clearly show a need to break further the link between emissions and economic growth. We know it can be done. Member States must plan and deliver on ambitious policies and measures if we are to meet our 2030 targets and our Paris agreement commitments. The ‘Trends and Projections in Europe’ package includes an assessment of progress towards the EU’s climate targets, preliminary EU greenhouse gas emissions estimates for 2017, a specific analysis of trends and projections in the EU Emissions Trading System (ETS) and briefing summarising the recent GHG trends and projections in Europe. It is published yearly by the EEA to take stock of the EU’s and Member States’ progress in meeting their climate and energy targets, which includes reducing greenhouse gas emissions by 20% compared to 1990 levels by 2020 and at least 40% by 2030. 'While the EU remains on track to meet its 2020 emissions reduction target, updated data shows Member States cannot afford to take progress beyond that date for granted. The data clearly show a need to break further the link between emissions and economic growth. We know it can be done. Member States must plan and deliver on ambitious policies and measures if we are to meet our 2030 targets and our Paris agreement commitments,' said Hans Bruyninckx, EEA Executive Director. According to preliminary data, emissions in 2017 across the whole EU increased by 0.6% from the year before. This corresponds to a 21.9% drop in emissions between 1990 and 2017. The slight increase prolongs a relatively stable trend in emissions observed since 2014, after a 10-year period of almost continuous reductions between 2004 and 2014. The rise is mostly due to the increase of oil consumption from road transport. The energy sector was able to reduce its emissions due to the decreasing share of coal used to produce electricity and heat in the EU. In the EU Emissions Trading System, emissions from stationary installations increased by 0.2% in 2017 from 2016. Power generation continues to drive emission reductions in the trading system. Emissions trends for industrial installations have been more variable, reflecting the economic developments observed in Europe over the last three trading periods. Aviation emissions from intra-EU flights, which are also included, grew by 4.5% in 2017 compared to the year before. The overall surplus of emission allowances continued to decline, for the third consecutive year, as a result of inter alia lower volumes of allowances being allocated for free. In 2017, emissions covered by the Effort Sharing Decision (ESD) (including transport, buildings, agriculture and waste) increased for the third year in a row. The rise was mostly driven by the road transport sector. Twenty-two Member States have emitted less than their annual greenhouse gas emission targets under the ESD set for 2016. This number is estimated to have decreased to 18 Member States in 2017. While total emissions from the entire EU remain below the 2020 target, the latest projections show that greenhouse gas emissions increased in more than half (17) of the EU Member States in 2017. The largest absolute growth in emissions occurred in Spain. Poland and France also saw large growth in emissions. The largest declines compared with 2016 occurred in Denmark, Finland and the United Kingdom. When the latest Member State projections are extended to 2030 and compared with the EU’s new binding target of at least a 40% reduction in domestic greenhouse gas emissions (compared with 1990 levels) by 2030, insufficient progress is shown by a vast majority of Member States. With current national policies, the pace of reductions is expected to slow after 2020 in EU ETS and Effort Sharing sectors, instead of accelerating. 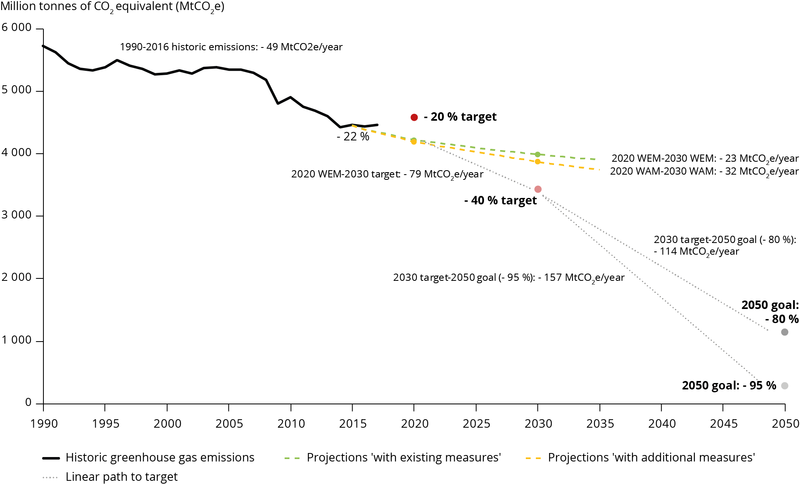 According to reported projections, EU-wide reductions of emissions by 2030 will reach only 30% below 1990 levels, based on existing mitigation measures, and only 32% when additional planned mitigation measures are considered. Only six Member States project emission levels below their respective 2030 targets under the EU’s Effort Sharing Regulation. Today's package complements the progress report published by the European Commission. The final part of the package, which assesses progress on energy targets will be published in the coming weeks. For references, please go to https://www.eea.europa.eu/highlights/increase-in-eu-greenhouse-gas or scan the QR code.